American in Paris (g. by Americain). 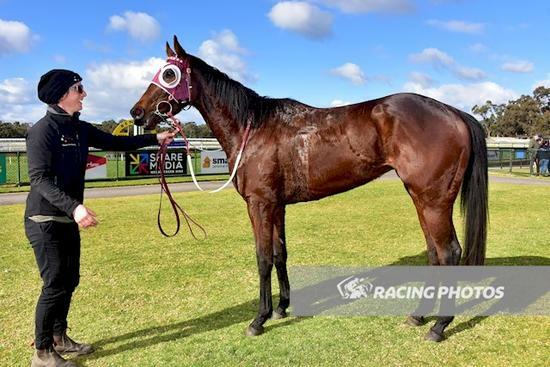 Winner at 2000m in 2018-19 in Aust. Set With Jewels (f. by Reset). Winner. See below. Seajamm. 3 wins to 1400m, TTC National Theatre H., Kingsmeadows Pharmacy H., 2d TTC Groovers H., Book Your Xmas Function H., Carrick Plate H., Millinery Parade at Mercure H., Graeme McCulloch H., Christmas Buffet H., P&D Murphy Wedding Anniversary H., TRC Cripps Bakery H., Navy H., 3d TTC Autobarn H.
DAWN COMMAND (Without Fear). Second on The 1978-79 Aust. 2YO Free H. 9 wins-3 at 2-at 1000m, 1200m, A$78,725 in Aust. and Malaysia, STC Pago Pago S., Gr.3, MVRC Helios H., SAJC Flying H., Ducal H., Tasman H., Selangor TC Class 1 H.-twice, Singapore TC Class 1 H., 2d STC Golden Slipper S., Gr.1, 3d VATC Blue Diamond S., Gr.1, 4th Selangor TC Yang Di-Pertuan Agong Gold Cup, L.
TRUE LABEL (Without Fear). 3 wins-1 at 2-to 1250m, A$77,810, VATC Mercedes-Benz H., L, SAJC Balcrest S., L, Bonnett's Saddlery H., 2d MVRC William Dunstan H., SAJC Directors Special S., VATC Roseberry H., 3d VATC Blue Diamond Prelude, Gr.3, 4th VRC Hilton on the Park S., Gr.3. Winner at 2400m in 2017-18 in Aust.